It is about a guard who always follows the general’s orders without question and as a cast of characters build up the guard makes sure that no-one is allowed on the next page. This is a story told with humour, however i’m not convinced that my children really ‘got’ it as they have no understanding of dictatorship (other than between the two younger children and their older brother). It is a great entry point into talking about this topic and history particularly in the context of Europe and as a result I’d suggest that it was most suitable for children in KS2 or KS3. One of the interesting aspects of the books was that the illustrations are quite crudely done clearly with felt tips. They felt very much like one of those early Mr Men books. As an adult I enjoyed the cast of characters at the front and end of the book, however, it did make the book feel rather amateur which has is positive and negative points. 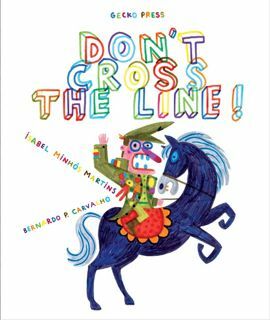 I think this could provide an interesting book and quite inspirational for children who enjoy illustration and art, its also useful for those considering the ideology behind dictatorships. It would make a great gift for a child of 11 +.